Who else has Halloween fever? If so, can someone recommend a specialist? This is just the off-topic open thread in which to do those kinds of things. 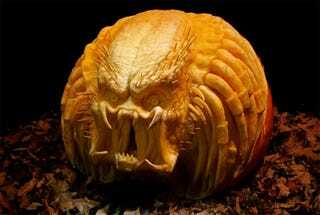 It's also the place for neat internet discoveries like Ray Villafane's insanely detailed pumpkin carvings. I was going to dedicate some time to pumpkin carving before this weekend, but really, what's the point. Someone's just going to do it a billion times better than you. NY Mag tries to quantify the "hipster" - For future generations to better understand the oft-misused derogatory term. Hey, you wanna buy a human body? - Or just a few parts? Body Worlds creator now selling dead people. io9's things learned at the Back to the Future reunion - I'm missing a theater screening right now! Yay! Kanye West's 34-minute-long "Runaway" video - Not a huge Kanye fan, but I enjoy the way he spends his money. NSFW. Nine Inch Nail's re-issuing Pretty Hate Machine - I will buy this.